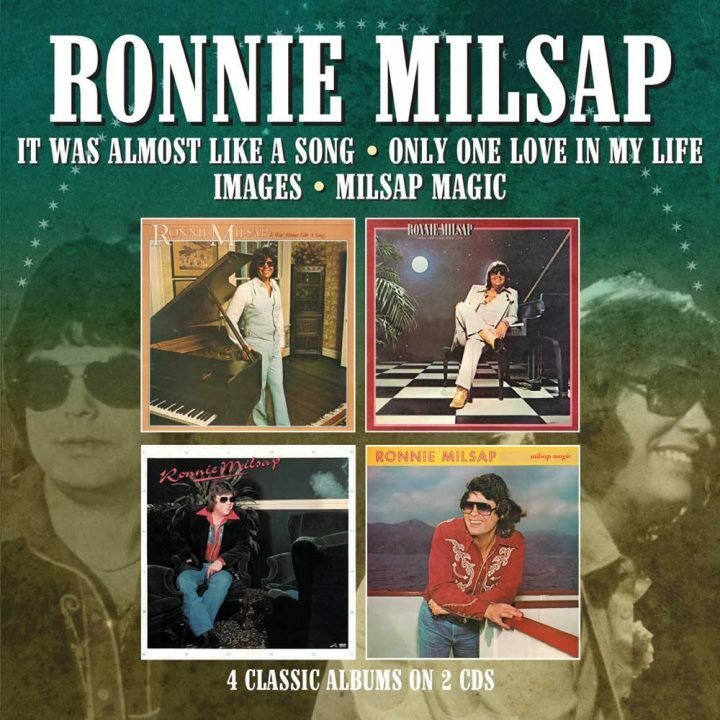 The four albums contained in this collection were released consecutively during the period 1977-1980, the productions broadened the boundaries of country music with their musicianship and song content, creating a framework in which Milsap’s vocals fitted perfectly. “It Was Almost Like A Song” (1977), was Ronnie Milsap’s eighth album for RCA and produced two No. 1 singles, the title track and ‘What A Difference You Made In My Life’. It won the CMA “Album of the Year” award. One of the finest voices to emerge in country music during the mid-1970s belonged to a blind singer from North Carolina, a vocalist who would fuse several different musical threads, chalk up a succession of major chart hits, attract capacity concert crowds, collect a mass of awards, and earn himself the music’s highest honour in 2014 with induction into Nashville’s Country Music Hall of Fame. That person was Ronnie Milsap. A native of Robbinsville, NC, and blind since birth, he began his music passage by listening to hillbilly music on the radio (Hank Williams, Webb Pierce and Hank Thompson were among his favourites, with the Grand Ole Opry an essential Saturday evening requisite) and gospel music in church. Possessing multi-instrumental skills, he learnt to play the violin by the time he turned seven, piano a year later and guitar at twelve. Two more country chart-toppers originated out of “Only One Love In My Life” (1978), the title track and ‘Let’s Take The Long Way Around The World’. ‘Back On My Mind’ peaked at No. 2. “Images” (1979) gave the singer his twelfth No. 1 with ‘Nobody Likes Sad Songs’ as well as a No. 6 slot with ‘In No Time At All’, a double-sided success with ‘Get It Up’. “Milsap Magic” (1980), provided two chart toppers, ‘Why Don’t You Spend The Night’ and ‘My Heart’. Ronnie Milsap remained on RCA until 1992 and scored over 60 hits, a staggering 35 of them reaching the top of the Billboard country charts.